You have been here before, but only in your imagination. You're gliding on air, above the crowd with clear view of everything ahead. At the same time, you're with crowd in perfect sync. No obstacles. No barriers. you find yourself traveling farther and seeing more. Go fast. Go slow. Go anywhere. This is how you envisioned travel sometime in the future.But this isn't the transportation of tomorrow. It's Segway, today. Segway Smart Motion Technology consits of an intelligent network of sensors, mechanical assemblies, and control systems that enable the Segway PT to balance and move on two wheels. The second you step on, five micro-machined gyroscopes and two accelerometers sense the changing terrain and your body position at 100 times per second - faster than your brain can think. We have brand new 2017 Segway second generation models! 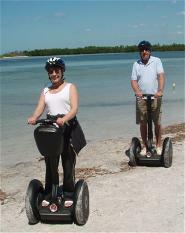 Segway Tours and Rentals are available in St. Pete Beach and Fort De Soto Park.